American pilot, one of the Mercury 13 female astronauts proposed in 1961, but never entered training. Status: Deceased. Born: 1927-03-03. Died: 2007-07-06. One of the group of women who went to the Lovelace Clinic in Albuquerque, New Mexico in 1961 and underwent the same medical and psychological tests that the Mercury 7 astronauts had completed. She was one of the Mercury 13 finalists, considered qualified by Dr. Lovelace for astronaut training. Later a pilot for a telephone company in Arizona. Family: Astronaut. Country: USA. Bibliography: 4452, 5687. 1927 March 3 - . Birth of Irene Leverton. - . Related Persons: Leverton. 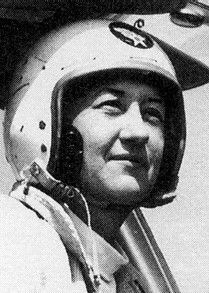 American pilot, one of the Mercury 13 female astronauts proposed in 1961, but never entered training..
1961 January 1 - . Mercury 13 Astronaut Training Group selected. - . Nation: USA. Related Persons: Allison, Cagle, Myrtle, Cobb, Dietrich, Dietrich, Marion, Funk, Gorelick, Hart, Jane, Hixson, Leverton, Steadman, Stumough, Truhill. Qualifications: Qualified jet pilot with minimum 1,500 flight-hours/10 years experience, bachelor's degree or equivalent, under 40 years old, under 180 cm height, excellent physical condition.. Randolph Lovelace was director of the clinic where the Mercury astronauts had undergone their physical examinations. He and Jacqueline Cochran, the first American woman to break the sound barrier, wanted to prove that women were equally qualified to be astronauts. In early 1961 they arranged for 20 highly qualified female pilots to take the same physical tests undergone by the Mercury astronauts. Thirteen passed the tests, but NASA maintained its position that astronauts had to be qualified test pilots (all of whom were white males). One of the thirteen was the wife of a US Senator, and some congressional hearings were arranged. Despite the publicity NASA was still unwilling to place them in the official NASA training program. Oddly enough, the selection of these women may have resulted in the first woman going into space after all. In May 1962 a Soviet delegation, including cosmonaut Gherman Titov and cosmonaut commander Nikolai Kamanin, visited Washington. Kamanin had been pushing for the flight of a Soviet woman into space since October 1961, and five Soviet female cosmonauts had just reported for training a month earlier. However the flight of a woman in space had little support from Chief Designer Korolev or Kamanin's military commanders. On May 3 Kamanin and Titov were invited to a barbecue at the home of astronaut John Glenn. Glenn, already politically-connected, was an enthusiastic supporter of the 'Lovelace 13'. Kamanin understood from Glenn that the first American woman would make a three-orbit Mercury flight by the end of 1962. Armed with the threat that 'the Americans will beat us', Kamanin was able to obtain a decision to go ahead with the first flight of a Soviet woman within weeks of his return. The Russians were obsessed with being first in space -- and even though NASA's female cosmonauts never materialised, Valentina Tereshkova of the Soviet Union became the first woman in space on June 16, 1963. 2007 July 6 - . Death of Irene Leverton. - . Related Persons: Leverton. American pilot, one of the Mercury 13 female astronauts proposed in 1961, but never entered training..